658 pages | 518 B/W Illus. The new, expanded edition continues to facilitate effective and active learning. 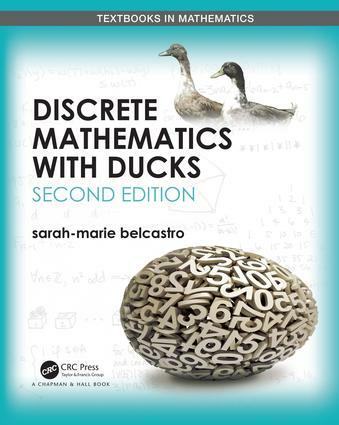 It is designed to help students learn about discrete mathematics through problem-based activities. These are created to inspire students to understand mathematics by actively practicing and doing,　which helps students better retain what they’ve learned. As such, each chapter contains a mixture of discovery-based activities, projects, expository text, in-class exercises, and homework problems. The author’s lively and friendly writing style is appealing to both instructors and students alike and encourages readers to learn. The book’s light-hearted approach to the subject is a guiding principle and helps students learn mathematical abstraction. sarah-marie belcastro is a free-range mathematician who works primarily in topological graph theory. She enjoys connecting people to each other, connecting ideas to each other, and connecting people to ideas. Among her many non-pure-mathematics interests are the mathematics of knitting, pharmacokinetics, dance (principally ballet and modern), and changing the world. sarah-marie did her undergraduate work at Haverford College and her Ph.D. at the University of Michigan. She currently directs the summer program MathILy.